Great deal on vacuum! 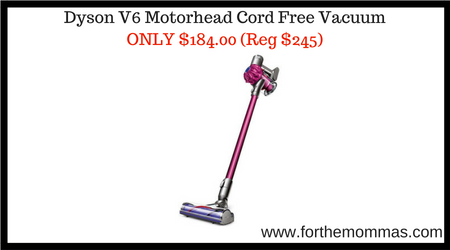 Score Dyson V6 Motorhead Cord Free Vacuum for ONLY $184.00 Shipped (Reg $245) in Amazon’s deal of the day 07/19. FREE Shipping on orders over $25.00 or with Amazon Prime Orders. 75% more brush bar power than the V6 Cord-free vacuum. Cord-free. Hassle-free. Quickly and easily clean when you need to . Up to 20 minutes of continuous suction. Trigger releases instantly. Also features max power mode – which provides up to 6 minutes of higher suction for more difficult tasks. The Direct-drive cleaner head drives bristles deeper into the carpet to remove even more dirt. 15 cyclones, arranged across two tiers, work in parallel to increase airflow and capture fine dust. Quickly convert to a handheld for quick clean ups, spot cleaning and cleaning difficult places. Includes convenient docking station that stores and charges the machine, and holds additional attachments. So it’s always ready to go.